Belgium has three official languages, Dutch (often referred to as "Flemish"), French, and German. The version of Dutch (Flemish) spoken in Belgium is principally spoken in the North of the country, and has some differences from the version of Dutch spoken in the Netherlands. Belgian French is principally spoken in the southern part of the country, known as the Walloon region. As with Flemish and Dutch, Belgian French does exhibit some differences from French as spoken in France. The German-speaking community principally lives in a small eastern region of Belgium, known as the "East Cantons" (German: Ost-Kantone). Rosetta Stone includes three components to help you learn fast with our exciting Dynamic Immersion method. The Rosetta Stone audio companion is not included with the download product. Rosetta Stone's live online lesson consists of practice sessions led by native speaking tutors. Enhance your learning on-the-go with Rosetta Stone mobile apps for the iPad, iPhone or iPod Touch device. Access included with purchase. Navigate your surroundings as you build on the vocabulary and essential language structure in Level 1. Learn to talk about your environment and enjoy basic social interactions – giving and getting directions, using transportation, telling time, dining out, and more. Build a foundation and navigate your surroundings. Learn fundamental vocabulary and essential language structure from greetings and introductions to simple questions and their answers. Gain the confidence to talk about your environment and enjoy basic social interactions – giving and getting directions, telling time, shopping, dining out, and more. Now you can learn a new language with the award-winning method used by the U.S. State Department to train diplomats. Proven effective by NASA astronauts, Peace Corps volunteers, and millions of students worldwide, the Rosetta Stone Language Library teaches new languages faster and easier than ever before. We all learn our childhood language by associating new words and phrases with the world around us. The Rosetta Stone method replicates this process by presenting vivid, real-life images to convey the meaning of each new phrase. Instead of translating, memorizing, and studying rules of grammar, you actually learn to think in the new language. Vocabulary and grammar are integrated systematically, leading to everyday proficiency. It's the natural way to learn. Now including an audio companion, reinforce language skills anywhere, anytime! This course includes Lessons 1-10 from the Dutch Level 1 Program - 5 hours of audio-only effective language learning with real-life spoken practice sessions. Get a chance to test drive the incredibly effective and efficient, world-famous Pimsleur Level 1 Program. Each lesson provides 30 minutes of spoken language practice, with an introductory conversation, and new vocabulary and structures. Detailed instructions enable you to understand and participate in the conversation. Practice for vocabulary introduced in previous lessons is included in each lesson. The emphasis is on pronunciation and comprehension, and on learning to speak Dutch. Dutch is the official language of the Netherlands and is one of three official languages in Belgium, where it is called Flemish. 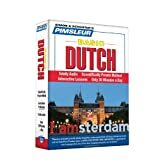 Pimsleur's Dutch teaches Standard Dutch, or "Newsreader Dutch," which is the dialect most widely spoken in the Netherlands. During the course, you will join Michel Thomas Method teachers Cobie Adkins-De Jong and Els Van Geyte and two students in a live lesson, hearing both their successes and their mistakes to keep you motivated and involved throughout the course. Within the very first hour you will be able to construct simple phrases by listening and thinking out answers for yourself without the pressure of writing or memorizing. Start Dutch with the Michel Thomas Method is an hour of essentials taken from Total Dutch with the Michel Thomas Method. After you finish your Start course, you can move to the Total Dutch course, which includes 9 hours of audio and a practice CD-ROM. Perfect Dutch follows on from the Total course with 5 hours of audio and a practice CD-ROM. Master Dutch with Learn Dutch - Word Power 101. This e-book is a completely new way to learn Dutch vocabulary fast - and for free! Start speaking Dutch in minutes with the powerful learning methods you will master in this book. The vocabulary words you’ll find in Learn Dutch - Word Power 101 were hand selected by our Dutch language teachers as the top 101 most frequently used words in the Dutch language. With each entry, you’ll see the word and a vibrant image to help remember the meaning. You’ll hear the word (separate free download) to master the pronunciation. Then you’ll see how the word is actually used in everyday speech with sample sentences and phrases. Learning Dutch vocabulary has never been easier! Have you always wanted to learn how to speak Dutch but simply didn’t have the time? If your desire is to learn complicated grammatical rules or to speak perfectly proper and precise Dutch, this book is not for you. However, if you need to actually hold a conversation while on a trip to the Netherlands, to impress that certain someone, or to be able to speak with your grandfather or grandmother as soon as possible, then the Nitzany Method is what you have been looking for. This method is designed for fluency in a foreign language, while communicating in the present tense. Nitzany believes that what’s most important is actually being able to understand and be understood by another human being right away. More formalized training in grammar rules, etc., can come later. This is one of the several, in a series of instructional language guides, the Nitzany Method’s revolutionary approach is the only one in the world that uses its unique language technology to actually enable you to speak and understand native speakers in the shortest amount of time possible. No more depending on volumes of books of fundamental, beginner, intermediate, and advanced levels, all with hundreds of pages in order to learn a language. With Conversational Dutch Quick and Easy, all you need are forty-six pages. Learn Dutch today, not tomorrow, and get started now! About ~50% of all written text in Dutch consists of the same 100 frequent, short, basic words. 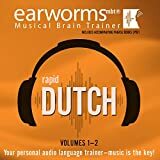 Earworms Musical Brain Trainer (MBT) Rapid Dutch is your personal audio language trainer, with more than two hundred essential words and phrases anchored into your long-term memory with great music! Volume 1 is your survival kit of essential words and phrases to get you by on your trip abroad. Volume 2 will have you talking about yourself (past, present and future), chatting, and even flirting! Do you want to learn Dutch with original Dutch stories? It's easy with Dutch and interlinear English. 150+ pages with every word translated so you can keep on reading. This book contains classic Dutch folktales. We have added an interlinear translation to the Dutch text. This means that the meaning of every Dutch word is immediately accessible, which in turn will make it much easier for you to expand your Dutch vocabulary fast. Read and re-read the text to memorize up to 2300 new words. Because the meaning of every Dutch word is below it, there's no look-up time and learning goes fast. The HypLern method entails that you re-read the text until you know the high frequency words just by reading, and then mark and learn the low frequency words in your reader or practice them with our brilliant App. Get Started in Dutch requires no prior experience in the language and gives you the opportunity to study at a reasonable, steady pace. This course makes the process nearly painless--it is written in a friendly and supportive tone, and the structure offers you plenty of opportunities for self-practice. You are in control of your learning experience, so you never feel overwhelmed or rushed. This practical course introduces the new language without inundating you and includes dialogues and exercises, a helpful pronunciation section, manageable lists of practical vocabulary, a glossary of grammar terms, and more. The accompanying audio CD features recordings by native speakers and contains dialogues from the book as well as exercises in listening and speaking. Learn to speak Dutch easily and efficiently.